September 24, South Bronx, NY - Green Worker Cooperatives held our annual “The Big Bronx Sancochazo” at Brook Park. Click on the image below to view our gallery of photos. We began the day with cooperative members tabling and presenting short workshops, and community groups talking about their services or campaigns. We had an amazing rotating set of volunteers stepping up to cook with the chefs from our current Co-op Academy. 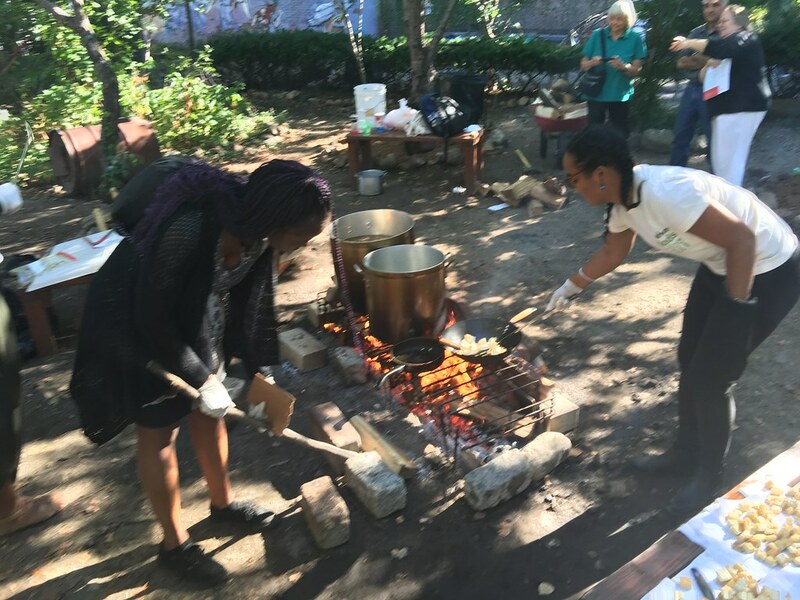 Together we made two versions of our sancocho - vegetarian and meat stews for all. Our kitchen was BUSY! There were so many people stepping in to give a hand to get more ingredients, to cut vegetables, and at one point, even to chop wood for the fire. Folks got to meet our current participant teams in the Co-op Academy who led the cooking, and everyone participated in some aspect of the two amazing sancochos. Thanks to WOKE Foods and Chulita’s Restaurant for cooking our delicious sancochazos! We had a several cooperative businesses on deck: POLIDO, instructing on how-to-ride-a-skateboard; Bio Classic Cleaning, demonstrating ecologically safe cleaning products; The House of Spoof Cooperative, teaching printmaking skills using recycled materials; Revolutionary Seeds, giving out soil-and-seed-balls for guerilla gardeners; and Ometeotl, showing off their wares using up-cycled materials to make elegant flower crowns and necklaces. We closed the day with several performances including traditional Aztec dancers, a belly dancing workshop, and modern Bollywood dance performance. As we ate the long-stewed meal we also listened to the alluring songs of Charles Duke, and watched live painting by a mural artist. We had about two hundred people throughout the event, this was probably the quietest part of the day, as people filled up on sancocho. We want to thank the organizations, groups, and individuals that supported us - with necessary items, and batches of food - all to co-create the magic of our Sancochazo! The Big Bronx Sancochazo is our annual community event that takes place the last Saturday of September at Brook Park! Thanks to our community and corporate sponsors! Left to right: Bronx Power, Bronx Spanish Evangelical Church, Cetiliztli Nauhcampa, Charles Duke, DJ Joel Pratt, Friends of Brook Park, Jetro Restaurant Depot, La Morada Restaurant, The Point, Youth Ministries for Peace and Justice.